It is a doubly happy day because we are still enjoying our house guest, and will be off shortly for a little retail therapy. We begin with a wise move at Talbots in response to a wardrobe choice made by First Lady Michelle Obama. The retailer is stepping up efforts to capitalize on such occasions. Below, the Double-face Wool Sheath from Talbots. Talbots may be taking a cue from J. Crew, very aggressive in exploiting multiple First Family appearances in their apparel and accessories. Brooks Brothers and Hickey Freeman have also used similar marketing techniques when the President is wearing their apparel. Ummm… does Mickey need a darker side? More Friday Fun for fans of Twilight: New Moon; the December Bazaar showcases stars Robert Pattinson and Kristen Stewart. The cover seen above is for the issue to be sold on newsstands; subscribers will receive this cover on their issues. Fans will appreciate the volume and quality of photos accompanying the lengthy interview with the stars. Of course, some real Friday Fun might best be found at South Coast Plaza, where the new Henri Bendel officially opens their new store today. Perhaps Muffy Martini can float down to Orange County and file a first-hand report for all of us at some point in the future! If asking the Christmas Fairy for one of these, they start at $12,995. Our reaction to seeing this little treasure? TDF. Completely and totally TDF. On that happy note, we hope everyone enjoys a bright and beautiful weekend! Hello-Hello, and a happy day to everyone! This is a Spring 2010 look from Emanuel Ungaro, proof positive that yes, one can have too much pink. Now, if this were done in womenswear? Yours truly would be obsessed with each piece, including those shoes. Or the idea of each piece, perhaps not the reality. From her mouth to The Consort’s ears our crack IT department (ahem). May we ask for a drumroll??? Whoo-hoo Miss Flip-Flops, you may now create your very own list of goodies from the Princess store! All that is required to make lists of your own is to scroll down the home page, on the left side you will see this button with a box underneath it. Type any search term you like in the box underneath that button, and you will be taken to a page asking if you are a New or Returning Customer. Once there you can login or sign up if not already registered (we never, ever sell or share your information with anyone, nor do we put you on our own internal mailing lists unless you specifically ask us to do so, we hate junk email as much as you do and respect your privacy) and as soon as you are at your personal account page you can start a shopping list. Our favorite part? You can make as many lists as you like, and name them however you choose, be it by occasion or event (like Birthday or Graduation) or a type of merchandise, or specific category (like Lilly Pulitzer or stationery), it is entirely your choice how many lists to make and how to name them. Thank you Miss Flip-Flops, for asking the question and nudging us to an improvement for the site! Next, the ongoing efforts of behalf of the Chicago bid for the 2016 Olympic Summer Games. Rather, one of the looks being sported (very. bad. pun.) by the women in our US delegation to the IOC meetings in Copenhagen. There are a number of pieces in this special collection by Maria Pinto for the women; the male delegates have suits and separates by Chicago-based Hart Schaffner Marx. Below, Michelle Obama arrives in Copenhagen to join in the efforts. The President is also going to help make the case on behalf of the city, with competition coming from Tokyo, Madrid and Rio de Janeiro. The IOC will choose the winning city in a vote on Friday Oct. 2. Despite all of the intense lobbying on behalf of Chicago, our bet is on Rio landing the games. These are the RuMe Junior Totes, brand new at the store. We love them for everyday use, carrying books, toys, craft supplies, just about anything. They are also ideal for your mini-prep to use on Halloween. One of the nicest things about these is being able to toss them in the wash machine, a huge plus for us when choosing reusable market bags. Besides, we are suckers for a cool Rocket Ship. We do love all of our eco-prep market bags and totes; we’re so grateful to have discovered these in bright and colorful prints and solids. We just didn’t want to replace plastic bags with something equally drab and dreary, let alone something that wouldn’t go over the shoulder or wasn’t machine washable. With these cheery colors we say g’bye until next time, thank you for visiting! We made a snap decision yesterday to play Blog Hooky, in part because it was the Consort’s Birthday. Who can resist spending the day with someone whose Mad Men avatar is this cool? It was a busy weekend in Water Mill (the Hamptons) with the Annual Super Saturday Sale at Nova’s Ark Project – think giant designer rummage sale with a carnival and other activities and you kind of get the picture. The event is a fundraiser for the Ovarian Cancer Research Fund, this weekend marked the Sale’s 12th year. Hosts included Kelly Ripa, Donna Karan, Ariel Foxman of InStyle magazine, and Gossip Girl star Blake Lively. Mr. Foxman can be seen with Ms. Lively in the photo above. Below, Kelly Ripa and husband Mark Consuelo. Also on hand, two outstanding designers, Charlotte Ronson and Shoshanna Lonstein Gruss. Below we see Ms. Lively with another Gossip Girl actress, Kelly Rutherford. In other G2 news, there is word that Tyra Banks will appear in an upcoming episode; the host of America’s Next Top Model will play an actress. And one last tidbit, another star from the show, Chace Crawford; he tells Glamour UK that he is already training for his big role in the remake of Footloose. “According to Nielson, the episode that aired on July 21, only had 751, 000 viewers. To compare to other prime-time shows that same night—Hawthorne, the new TNT show with Jada Pinkett Smith, had 3.2 million viewers… and the most watched show was The Deadliest Catch, a documentary series about fishing boats, which had 3.4 million viewers. We have many little retail tidbits to share, starting with the FLOTUS (First Lady of the United States) in another Talbots dress, this time on Saturday while in Norfolk. Mrs. Obama was there to speak to returning sailors aboard the USS Eisenhower, as well as the US Comfort battle group. The dress is quite the bargain, now selling at $39.99 as opposed to its original price of $139. We are blasting out the door with The Consort for a day at the museum, an exhibit called Cars and Guitars. That’s all he wanted for the big birthday, this exhibit and homemade brownies, how easy is that? TP is the luckiest Princess on the Planet, to be sure. Sigh. Hello-Hello, and apologies for the lack of a post yesterday! We can only attribute it to loads of Princess personalization ordering and the Lilly pre-orders, yikes! Sadly we start with something transcending a fashion faux-pas dollfaces, more like a fashion disaster In Our Most Humble of Opinions. Sigh. Behold actress Hayden Panettiere Monday on her way to tape the David Letterman show. While we understand Ms. Panettiere’s need to promote her new film, is the sheer Caroline Seikaly dress even remotely appropriate for someone not yet 20 years old? This is eerily reminscent of the dress (seen here) worn by Gossip Girl star Leighton Meester at an MTV awards show in June. Harrumph! 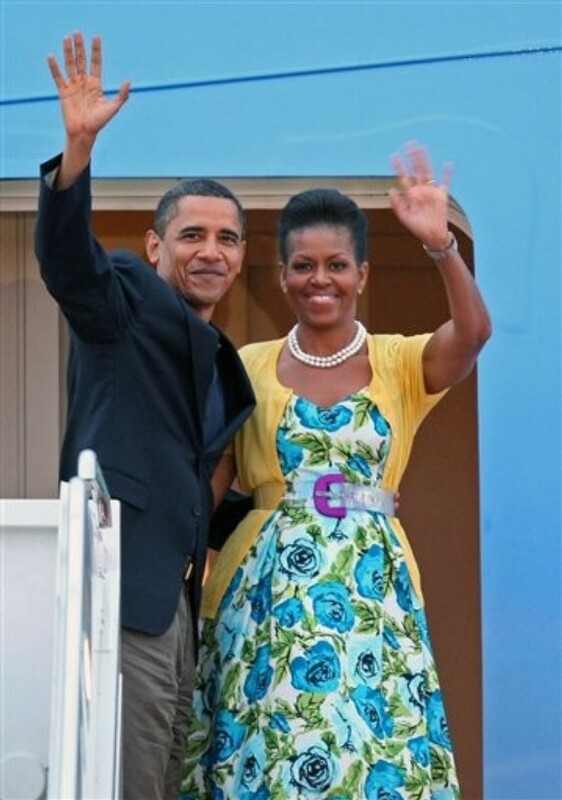 On a more upbeat note, the marketing minds at Talbots must have been thrilled to see First Lady Michelle Obama in their rose print dress again, worn this Sunday when boarding Air Force One on the way to Moscow. BTW, the Talbots Clearance Sale now offers an additional 25% off already reduced prices, making the dress seen above $89.99; it was originally priced at $169.99. Once arriving in Moscow Sasha and Malia Obama exited the plane in J. Crew. 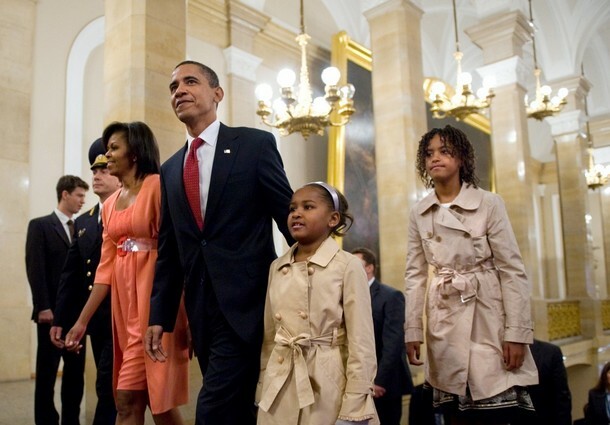 Malia was wearing the Silk Taffeta Trench ($298) and Sasha wore the Girls Crushed Twill Trench (now on sale at $129.99). Both girls also wore ballet flats from Crew; Sasha in the Printed Minna Flat (left, $98-$108) and Malia in the Womens Black Satin Flats with Contrast Trim (lower right, $98). And a reminder that J. Crew is also doing a Clearance Sale, with an additional 20% off already reduced merchandise; use promo code EXTRA20 when checking out to receive the discount. Remember Hadley-Pollet, the firm doing reversible ribbon belts, as well as totes? If you are a fan of the brand and in the Boston area, the company is having their first sample sale in years this Friday and Saturday. The place to be for the bargains is 230 Newbury St. These come finished with a beautiful blue grosgrain ribbon bow, a really cute touch. The Boxed Note Cards have more island scenes, including an adorable pink station wagon! We’re so ga-ga over that vintage wagon with the wood panels we are takiing executive action and making it today’s Pretty in Pink. We shall leave you with that cheery beach scene, hoping your afternoons are filled with summer splendor! Today’s post is an exercise in what we refer to as pre-blogging, written in advance of a heavy schedule; we expect we shall be winging our way to The Queen Mother’s as you read this. Immediately our hackles went up as we said to ourselves, “Now wait just one minute.” But upon reading Megan Basham’s column, we find ourselves in agreement with much of her perspective. For more on the “trickle-down narcissism” column click here. One request: let’s not throw the Princess out with the tiara, so to speak? We have an update on tennis fashion just in time for Wimbledon, direct from our favorite tennis blog, Down the Line Tennis. Scottish star Andy Murray‘s is expected to wear the ensemble shown above, all classic pieces by Fred Perry, one of Mr. Murray’s sponsors. 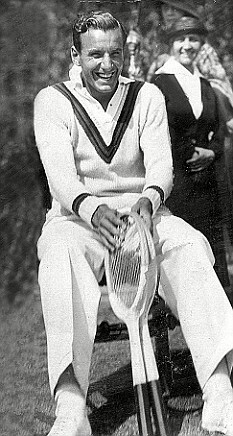 The look is meant to emulate the styles worn by Mr. Perry in the 1930’s when he won Wimbledon. A timeless style, and one we adore. Some say the look is part of a greater campaign to help the sometimes-surly Murray move beyond his anti-English image. Those interested in something for off-the-court wear may find the company’s accessories appealing, including the Tipped Webbing Belt. Many readers may already be aware there has been significant speculation as to whether or not Rafael Nadal would play in this year’s tournament; that conversation ended yesterday when he began practicing on one of the famed grass courts. It does not appear we will see Roger Federer in his famous cardigan again, the one prompting our original Preppy vs. Pirate post. 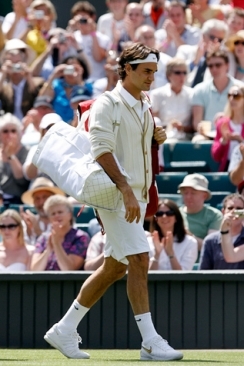 We confess we don’t yet know what Mr. Federer is sporting for a signature look this year. Fiscally-friendly bargains abound, like the Jitney Cashmere Sweater is now $88. The original price was $295. The sale ends the 19th. For today’s Pretty in Pink we offer Blake Lively at Monday night’s big do, the CFDA Fashion Awards. The Gossip Girl star was wearing Michael Kors. Also in attendance, Andrew Lauren, Dylan Lauren and David Lauren. 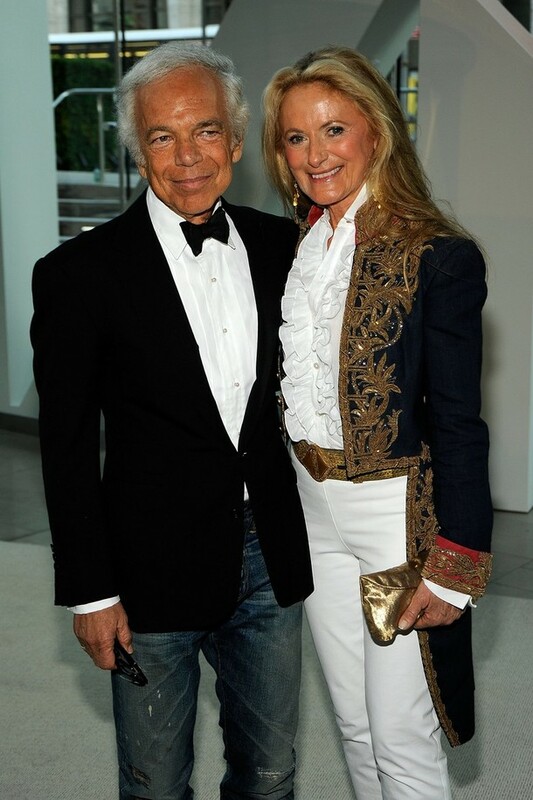 The whole clan was on hand, including Ralph Lauren and Ricky Lauren; he took home the Most Popular vote award, the first time the award has been made. The Ullman quote is courtesy of this story in today’s WWD. Another designer and retailer of a preppish nature, Tory Burch, wore her own design for the gala. Lauren Santo Domingo also wore Michael Kors. Tomorrow’s post will feature loads of looks from this year’s Royal Ascot. Below, the Queen and Prince Philip on their way to the event yesterday. Until next time, enjoy your day dollfaces! Earlier this week we promised to share a couple of the Kate Spade Fall 2009 looks, and then were derelict in our duty! As we mentioned previously, this collection is vital for the designer, as it includes her first foray into the clothing market. NOTE: All photos by Kyle Ericksen & Women’s Wear Daily. Many pieces display the classic lines and tailoring associated with Kate Spade designs. The presentation used both models and mannequins to showcase the fashions. From what we were able to glean there are hits and misses, as one expects in a first effort. In keeping with the Spade tradition, there are also outstanding accessories in this fall’s collection. These appear to be pretty much in keeping with previous collections, in lush, rich colors, along with a touch of whimsy. Clearly many items for serious consideration this fall! Most fashionistas know today is an enormous date on the fashion calendar. The nation’s first Topshop is now open in Soho. The trendy British store carries a very successful line from Kate Moss, who is in town for the opening. Below, Ms. Moss arriving at the store Tuesday. Also taking part in festivities surrounding the store’s grand opening, teen actress Taylor Momsen of Gossip Girl notoriety. Observant readers may have noted the skirt worn by Ms. Momsen is not being showcased in today’s Pretty in Pink. It seemed a trifle short for someone of TP’s advanced age and tedious taste. As we appear to be awash in G2 news (and we’re not talking about London) today, has everyone heard that Chace Crawford is likely to take Zac Effron’s place in the remake of the film Footloose. It seems Mr. Crawford had a particularly solid audition for the role Mr. Effron decided was not right for him. Tracey Lomrantz at Glamour.com has a fabulous post about men in kilts, including another of the Gossip Guys, Chuck Bass. Of course we’re talking about Gossip Girl star Ed Westwick. The occasion was the annual Dressed to Kilt fashion show hosted by with Sir Sean Connery; the event is a fundraiser for the Friends of Scotland. “While many of the stars suited their kilts, Miss Scotland Stephanie Willemse, 20, made a fashion faux pas with her catwalk outfit. The photo caption referred to it as a “Meringue Moment”. That sounds a little harsh…no? A few sales at “preppy retailers,” we wanted to share, including the Polo Ralph Lauren Friends and Family sale. Offering 30% off, the sale runs through April 14. To receive the discount use promo code RLSP2009 at checkout. As we have been chatting about both Gossip Girl and Ralph Lauren, this seemed an appropriate item to highlight: the Cotton Cricket Sport Coat. Another retailer whose classic lines many preps enjoy, Tory Burch, is offering up to 60% off original prices. Today we close with an Adventure in Argyle, as worn by First Lady Michelle Obama. Oops. Not a look we favor, but then, we are just stuck in our ways and cannot remember any daytime occasion where sequins might be deemed appropriate. To be honest, the Palace has made it clear no one is disturbed by the ‘breach.’ We’re thinking Europa Fox and/or Queen Bee Swain will be able to shed more light on these developments. And on that note dolls, we’re off!